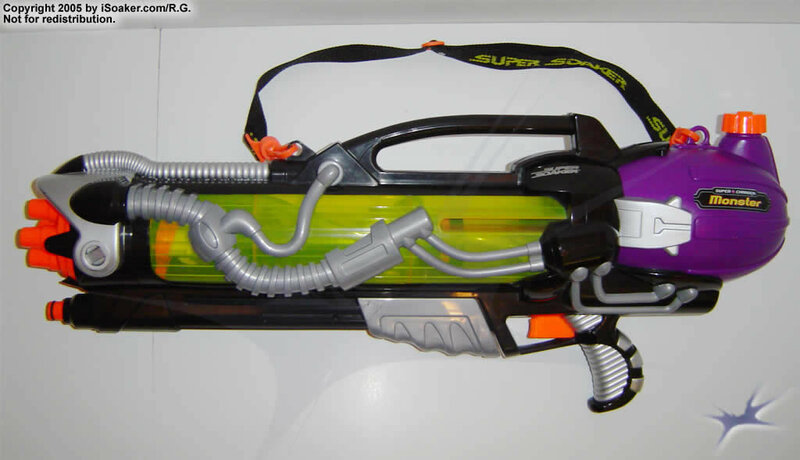 Like the Super Soaker CPS 1500, the Super Soaker Monster (2001) remains also one of my all-time favourite water blasters. The smallest of the “Monster” series of Super Soaker water blasters, the Super Soaker Monster (2001) is actually my preferred one of the three. 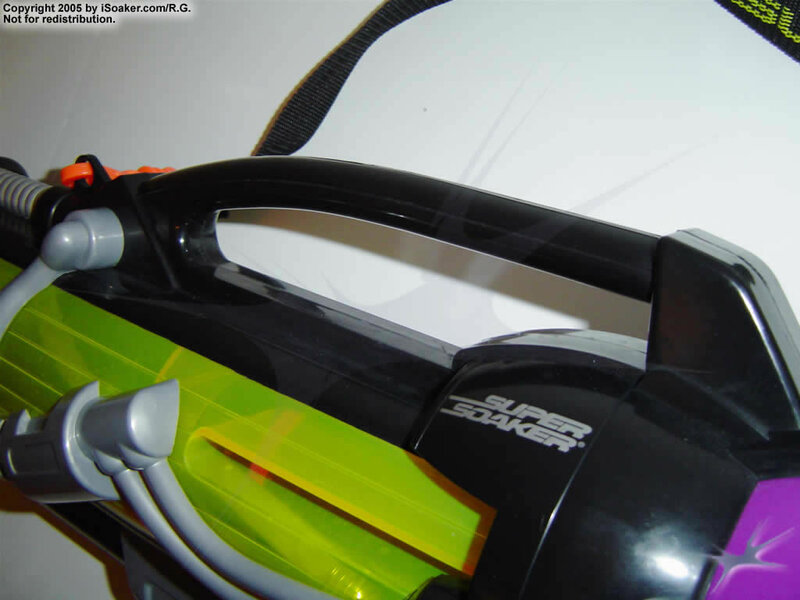 Evolving (or, more accurately, devolving) into the Super Soaker CPS 4100 for 2002, the Super Soaker Monster (2001) has a great design and provides solid performance. 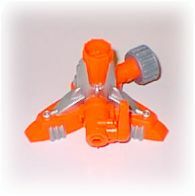 Interestingly, it is because Hasbro/Larami decided to create a smaller “Monster-class” water blaster that the original Super Soaker Monster ended up being renamed as the Super Soaker Monster X. However, it also has some traits that could have been improved upon. Unfortunately, also like Super Soaker CPS 1500, the Super Soaker Monster (2001) evolution line ended all too soon. 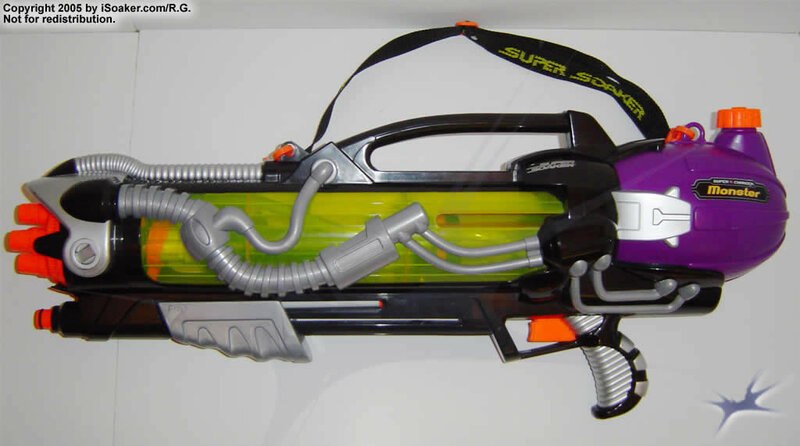 The Super Soaker Monster (2001) was sold in black and grey “Monster Series”-themed Super Soaker packaging. Considering the Monster (2001) water blaster is even longer than a Super Soaker CPS 2700, it should come as no surprise that the box for the Monster (2001) is large with reinforced side panels and a large base to allow the box to keep the water blaster upright while on store shelves. 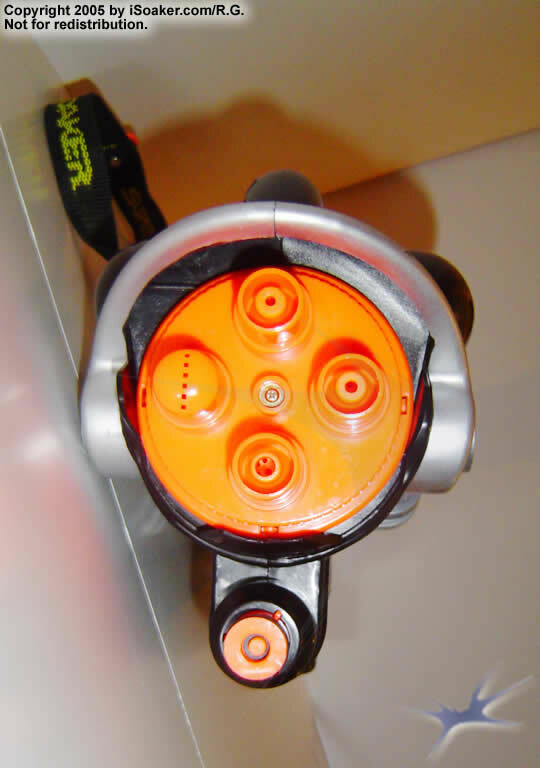 Easily visible at first glance are the Monster (2001)’s nozzle selector with 4 nozzle settings, a fast-fill port, its top shoulder strap and carry handle, reservoir fill cap, fully tracked pump, and an interesting indent on the body of the water blaster for permitting one to see its cylindrical CPS chamber expand and contract when in use. Despite the size of the packaging, the Monster (2001) is mounted within the box in such a way that its full side profile is visible, though trying to feel the trigger-grip area while the water blaster is still in the box does not work so well. Free from its packaging, the full essence of the Super Soaker Monster (2001) comes into view. While the shortest of the Monster-series, the Monster (2001) is actually quite long compared to most other water blasters. 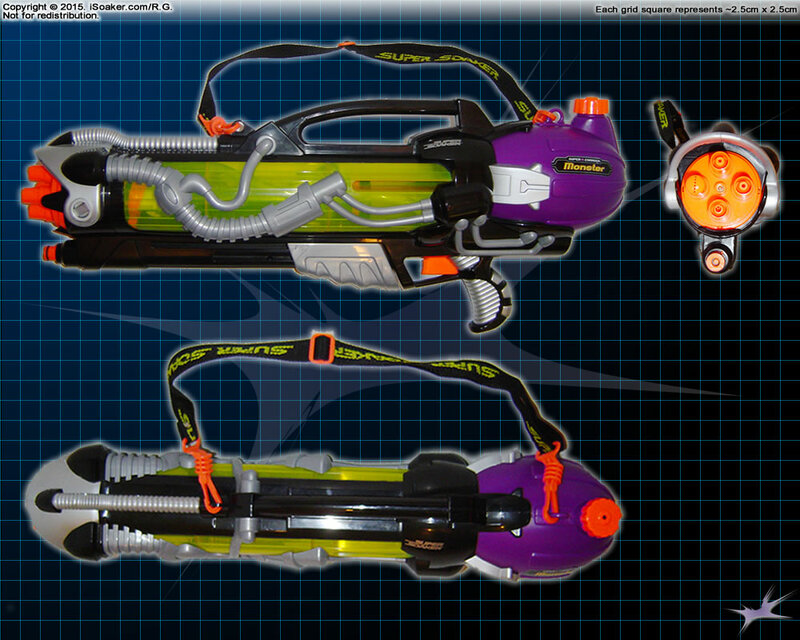 It presently ranks as the 10th longest water blaster in the iSoaker.com database, beating out even the Nerf Super Soaker Hydro Cannon. The Super Soaker CPS 4100 measured in slightly shorter, though it is unclear why (perhaps the shape of the reservoir which looks slightly chubbier than the Monster (2001)?). Picking up the Monster (2001), one feels it has a decent weight. In terms of power and capacity, it is best compared with a Super Soaker CPS 1000. Comparing dry-weights, the Monster (2001) is over 700g (~26oz.) heavier than the CPS 1000. The Monster (2001) is also nearly 20cm (~7″) longer, but actually carries slightly less water in both its reservoir and pressure chamber. 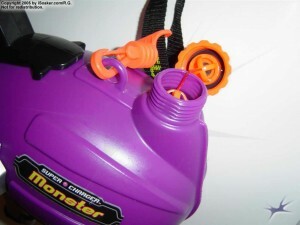 Unlike the Super Soaker CPS 1000, the Monster (2001) has a nozzle selector with four possible settings: three stream settings and one fan setting. All of the stream settings have their uses from the “2.5x” water conserving blasts, the “4x” average blast, and the “8.5x” drenching blast. Actual measured output for all the stream settings yielded true outputs actually above the nozzle identifier. In fact, the “8.5x” setting pushed out water faster than a Super Soaker CPS 1500’s “10x” setting! Beyond the stream settings, the Monster (2001)’s “fan” setting is actually more aptly named a “spread” setting, blasting out 6 streams that spread outwardly from their origin. While the range for each blast of the “spread” is less than the range achieved by the stream settings, the area covered is significantly increased making it near impossible for anyone close enough to evade being hit by at least one, if not more, of these blasts. Like all blasters in the “Monster” series, the Monster (2001) features two methods for charging its CPS-class pressure chamber and filling its reservoir. 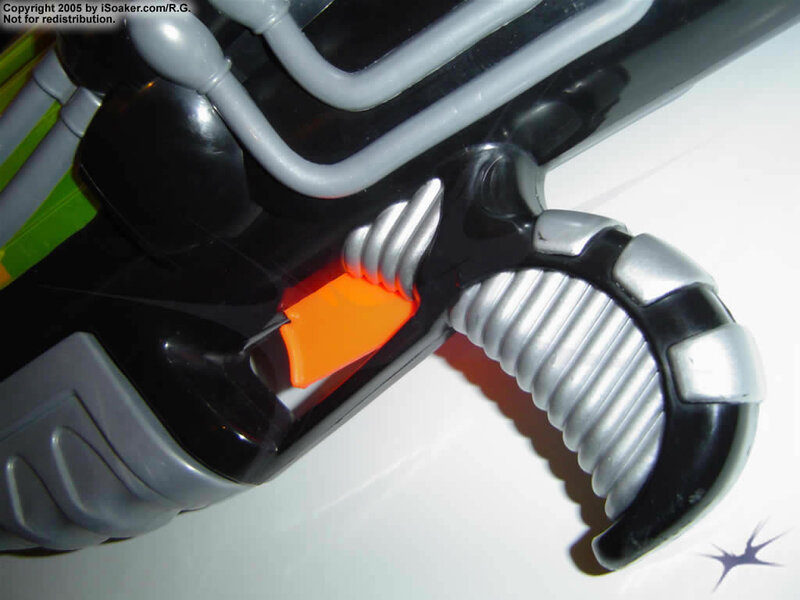 The top-mounted handle makes refilling the Monster (2001) easier to do since it provides a secure place to hold the blaster. Like most other pressurized water blasters with a separate firing chamber, the Monster (2001) can be filled manually by taking off the tethered cap on its reservoir and adding water into the hole. 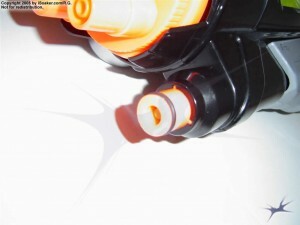 These well-made caps feature both a rubber o-ring to seal the reservoir as well as a rubber one-way vale in its center to permit air to enter the reservoir while preventing water from dribbling out if the water blaster happens to be left resting on its side when filled. A plastic anchor is attached to the upper cap via a short red string. Found on most larger pressurized water blasters between 1998-2001, this little feature helped prevent a lot of Users from losing their reservoir caps. The only down-side to the anchor was that, when the cap was in place, the anchor could swing freely, hitting the inside of the reservoir and making a tapping noise. While not particularly loud, this sound can give one’s position away when attempting to perform a surprise attack. That said, once the reservoir has water in it, it takes just a handful of pumps to get the CPS-class chamber to operating pressure (though it takes several pumps to completely fill the pressure chamber). The other way to filling AND pressurizing the Monster (2001) requires an active hose connection and a properly attached Fast Fill Device (a.k.a. Quick Fill Device/Q.F.D.). A quick note on the Monster-class Q.F.D. : unlike the original Q.F.D., the Q.F.D. supplied with Monster-class Super Soakers included the outlet on the side to allow the hose to be used to refill other non-Fast-Fill water blasters without needing to remove the Q.F.D. Moreover, additional silver-painted plastic reinforcements were added to the sides and legs of the Monster-class Q.F.D. to give it more strength to handle the greater weight of the Monster-class Super Soakers. Jamming the fast-fill port of the Monster (2001) into an active Q.F.D. will first fill/charge the CPS-class pressure chamber. The nice thing about this is that one can quickly disengage and let a blast of water fly if being attacked while attempting to refill. Once the pressure chamber is filled, the internal over-pressure valve will activate and permit water to subsequently flow into the reservoir as well. If one continues to attempt to fill beyond the reservoir’s full capacity, excess water will be released through the reservoir cap’s valve. One thing to note is that one needs adequate pressure provided by the hose for this system to work. Hoses that do not provide enough water pressure may not be able to fill the pressure chamber or may not be able to trigger the over-pressure valve to permit filling the reservoir through use of the Q.F.D. Thankfully, even if the case, the Monster (2001) can always be filled manually as described above. As noted earlier, the streams produced by the Monster (2001) provide both solid power and satisfying range. The cylindrical CPS-chamber is partially visible through the semi-translucent shell. Interestingly enough, Larami Ltd. opted to indent part of the body in an attempt to make it easier to see how much the pressure chamber had filled. However, due to the depth of the opening and lack of markings, few make use of this feature and simply pump until either the over-pressure valve kicks in or the reservoir runs out of water. The Monster (2001)’s shoulder strap comes in handy when carrying this water blaster around for the long haul. Its dry weight is heavier than many smaller water blasters’ filled weight and its filled weight does put a strain on one’s arms after awhile without a shoulder strap handy. A properly adjusted shoulder strap not only allows one to move around more easily with the Monster (2001), but it even allows one to sling this blaster to the back and use another one if need be. Sadly, this level of flexibility and capability is rarely seen on more modern water blasters. Of course, how good a water blaster is really boils down to battle performance and the Monster (2001) does so very well. With its powerful cylindrical CPS-type chamber, good pressurized volume, solid nozzle selections, and a good-sized reservoir, the Super Soaker Monster (2001) can keep up with pretty much any other water blaster out there. Sure, there are a handful of blasters that can push more output, but few offer the same level of flexibility as well as options for refilling and repressurizing as the Monster (2001) has. One minor problem noted for the Monster (2001) is that its trigger-grip area, at least on the version tested, was not optimally shaped and prolonged use results in a little chafing between the thumb and index fingers. This problem can be remedied by adding a little soft tape to that region and only really happens after >45 minutes of continuous use. The only other gripe regarding the Monster (2001) is the fact that it is fairly long given its overall water capacity. While its length adds to its intimidation factor, there is a lot of internal space occupied by air that could theoretically have been used for increasing the Monster (2001)’s overall reservoir capacity. Sure, in doing so, it would have also gotten heavier, but it has a shoulder strap, reducing the encumbrance of the potential added weight. The Super Soaker Monster (2001) makes a great addition to anyone’s armoury. Solid performance, good capacity, and great flexibility made the Monster (2001) my primary choice for several years after its release. While longer than a Super Soaker CPS 1500, yet with power somewhere between a CPS 1000 and CPS1500, Monster (2001), with its multiple nozzle options, offers plenty of flexibility and endurance, enabling it to be an excellent choice for nearly any game type. If only they still made water blasters like this one.